Convenient plugin air purifier can be easily moved where you need it most. We are excited and proud to announce the debut of the new improved and better designed FreshAir Focus! Everything about it is new – from the sleek, streamlined exterior to the new continuous ionization and push-button purifier function. This Focus is like nothing you've seen before! The new FreshAir Focus has replaced the previous model's single needle point ionizer with new 4 needle point ionizers, which allows for improved distribution of ionization into your environment. It still covers approximately 50 square feet, making it the perfect size for a hotel room or bathroom. The FreshAir Focus now has an attractive FreshAir button, which allows you to control the activated oxygen feature at your discretion. 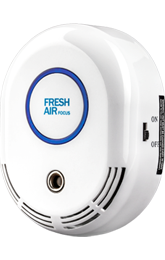 No Sprays, Perfumes, or Chemicals Needed The advanced technology contained within the FreshAir Focus serves to make breathing easier, cleaner and healthier. This simple, elegant unit provides the cleanest, freshest air possible within small low ventilated areas. FreshAir Focus also has a purification function to quickly freshen the air as it is being cleaned. The ionizer Purification function is easily activated using the button on the front of the unit and automatically turns off after 30 minutes. The purification function can also be turned off manually be pressing the button on the front of the unit a second time.